Properties in San Ignacio Market average 4.7 out of 5 stars. 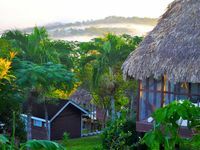 Your home away from home while exploring beautiful country of Belize. Property 14: Your home away from home while exploring beautiful country of Belize. The property at Cahal Pech was wonderful. Staff including James, Ian, Oscar, Jeanita, Jaime, were ALL fantastic. As you can tell the staff are attentive and very friendly. We hired a ride from Belize airport to Cahal Pech which can be a 2 hour ride. It was comparable to renting a car and we didn&rsquo;t have to navigate. This place has so many places to see and things to do around San Ignacio. The hotel organized sight seeing trips to TIKAL and ATM! We stayed in the cabanas which were nice.l, just remember you are exposed to the outside noise, like scar noise, the rooster and dog barking that lives on property. Cabanas were unique and a great addition to the property. Restaurant and bar on site have wonderful food. Take a trip to town and grab some street tacos!